We love tech here at Techish. And we know how to use it. But sometimes we don’t do anything with it but wear it as bling. (I have been known to wear several Fitbits, some not even charged.) But this line of jewelry from Circuit Breaker Labs asks for nothing more. 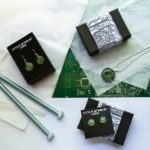 These rings, necklaces, earrings, badge holders, and even dog tags (for humans) are made from actual circuits boards, captured under epoxy resin. 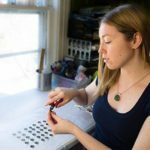 The idea for the jewelry came about when Amanda Preske watched her brother tear apart a computer, in an attempt to repair it. A young – as in teenager! — jewelry maker, she was fascinated by the beauty of the tiny circuit boards. Viewed up close on the scale a jewelry maker works in, she saw intricate cityscapes or maps of strange worlds in the electronics. 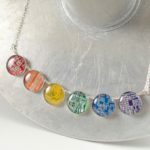 She started making them into jewelry and selling it on Etsy in 2007. Today that youthful diversion is a full-time thing, with a staff and a Web site: Circuit Breaker Labs. I got you a deal on anything in this geeky line of lovely. Go to Circuit Breaker Labs. Pick out something pretty. And, at checkout, use the code TECHISH to get 20 percent off your purchase. Expires on July 31.